The share of official development assistance (ODA) to Uganda going through multilateral organisations fell in 2012, while aid going through the public sector and civil society increased. ODA from multilaterals has gradually declined since 2006 when – partly because of debt relief – they accounted for almost 60% of the US$5.9 billion in ODA in that year. By 2012 this share had fallen to 7.7%. 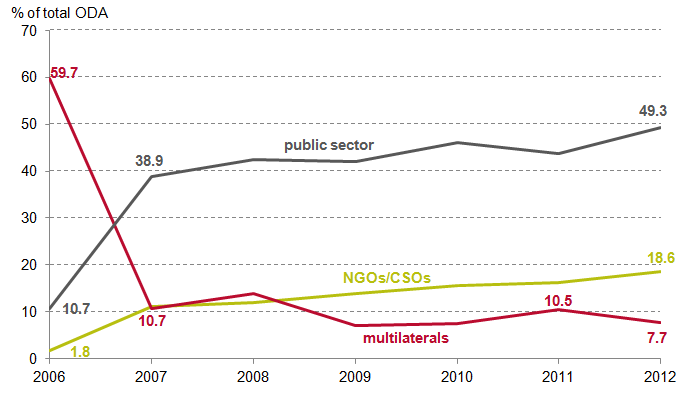 In 2006, the proportion of aid going through the public sector stood at 10.7%, which has increased to 49.3% in 2012. The share going through non-governmental organisations (NGO) and civil society organisations (CSO) has also increased, from 1.8% in 2006 to 18.6% in 2012. The increase in resources for civil society has enabled greater engagement with the Ugandan government on democracy, good governance and civic participation, among other issues. 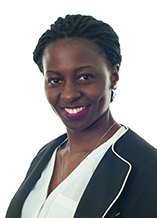 This is the third in a three-blog series on Uganda’s budget. See Uganda’s budget: aid stayed steady while budget support fell and Aid accounts for a falling share of Uganda’s budget. ‘Public sector’ can refer to the public sector in either donor or recipient country.